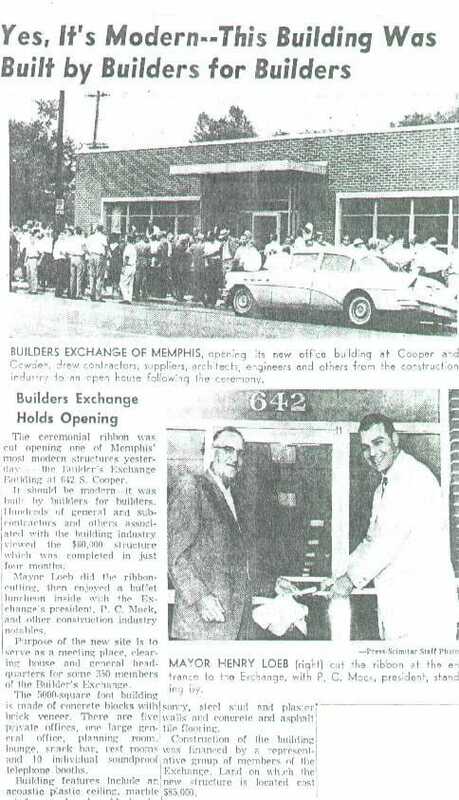 Although the Memphis Builders Exchange was chartered in 1890, the idea of a central meeting place for builders goes back to the guilds of ancient Rome. Fast forward a few thousand years to the late nineteenth century. That’s when the advent of skyscrapers generated a national construction boom and America saw the birth of the modern builders exchange. By 1899, the newly constituted Memphis exchange had its home in the Planters Building in downtown Memphis, and was incorporated on January 30, 1900. In October of that year, there were 76 members from 48 firms within the construction industry. Its first president was C.J. Wagner of C.J. Wagner General Contracting Company. In February of 1905, a fire gutted the building, which forced the Exchange to relocate to 149 Madison Avenue, where it occupied two floors until a growing membership necessitated acquiring space in the basement of the Goodwyn Institute Building in 1907. Twelve years later, the Exchange relocated operations again to what was known as the Scimitar Building. Two more moves followed: in 1923, to the second floor of the building on the northwest corner of Union and Third, and in 1934, to 166 Monroe. After First National Bank of Memphis acquired the site at 149 Madison in the late fifties, a decision was made to purchase land in Midtown where a new building would be erected. A site at 642 South Cooper Street was located and purchased for $85,000. George Mahan, Jr. and Arnold Shappley, Jr. of Mahan and Shappley Architects were selected as design principals. The board saw this as an opportunity to create a state of the art facility equipped with the latest amenities, including private phone booths and a lounge. And in a nod to the growing importance of the automobile in the postwar period, leaders sought to provide plenty of off street parking, a feature not available in the previous downtown locations. 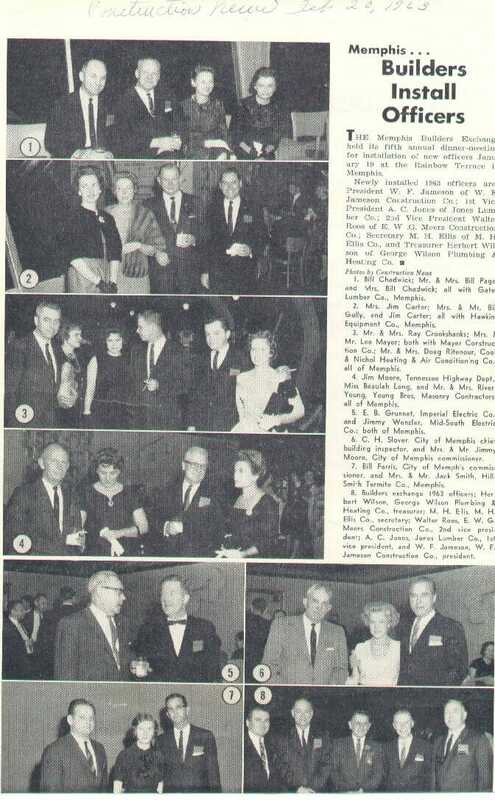 On April 10, 1960, a groundbreaking ceremony was held at the Cooper Street site, officiated by P.C. Mock, president of the Exchange. Four months later, our current home was completed. On September 22, with Mayor Henry Loeb and other dignitaries in attendance, the ribbon was cut and the building dedicated. A luncheon followed where members and visitors got to tour the gleaming new facility. 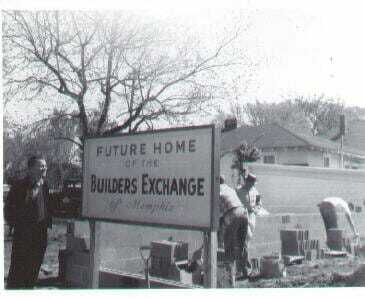 Originally budgeted for $100,000, the Exchange was built for $60,000 thanks to the help of board members who contributed their workforces during construction. Membership continued to grow and the plan room was so busy at times, that to look at a set of drawings then often required waiting in line to gain access. But with the dawn of the digital era, tech entrepreneurs saw a way to make offering and bidding jobs more efficient. By the new millennium, it was no longer necessary to drive to an Exchange to view paper plans, do the take-off while there and use a telephone to communicate bid specifics. In 2002, the Memphis Builders Exchange responded by creating a virtual plan room that members can access from anywhere. We continue to maintain a physical plan room where members can come to view bid specifics on our computer monitors and have the plans printed out. Today, there are over 200 organizations still operating in the United States that were created as builders exchanges, the average of whom was founded in 1916. 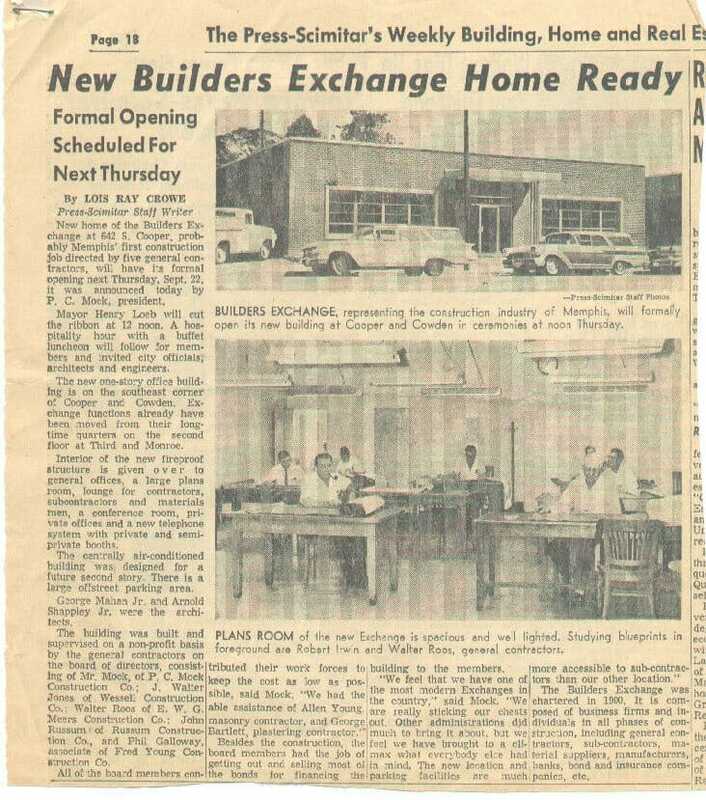 The Memphis Builders Exchange is a proud part of that century old tradition and looks forward to remaining a key resource for the local construction industry for years to come.